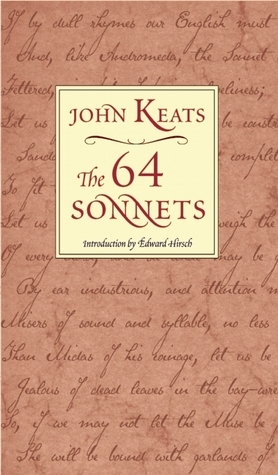 The 64 extant sonnets of John Keats make for a very interesting read for anyone interested in formal verse. Not only do we have the poet developing his skills and expression in the last five years of his short life (he was 18 when he wrote his first sonnet, and died at 23), but he consciously experimented with the form, outlining in his letters the shortcomings that he saw in the Petrarchan and Shakespearean versions while he looked for a better structure. This collection has a useful but insufficient introduction by Edward Hirsch and incompetent notes by Gary Hawkins. Hirsch writes of the development of Keats’ themes, but fails to tie the poems into the details of his life. I suggest reading at least the Wikipedia entry on Keats to get a fuller sense of what was going on in his mind, his life, his environment. The notes by Hawkins appear to have been thrown together without either care or insight. There is a facing page of three or four comments for each poem, and there is a further note on the rhyme scheme in an appendix at the back. The appendix catches four of the lengthened lines (6 or even 7 feet in a line) but misses three of them; and notes one of the shortened lines but misses another. Worse, the analysis of the rhyme scheme for the technically most interesting sonnet (“If by dull rhymes our English must be chain’d”) fails to understand the structure Keats was creating, despite quoting his comments in the letter containing the poem. abc; abd; cab; cde; de. Hawkins also makes errors of fact and interpretation in the notes facing the sonnets themselves. The very first sonnet, written in 1814, references “the triple kingdom” which Hawkins explains as “Great Britain, composed of England, Scotland and Wales.” Wrong. With the Act of Union of 1801 the three kingdoms of England, Scotland and Ireland were united, as represented by the simultaneous creation of the Union Jack with its combination of the crosses of the three flags. Wales was not a kingdom but a principality, and its flag never figured in the larger national flags. In the sonnet “How many bards gild the lapses of time!”, Keats writes “A few of them have ever been the food / Of my delighted fancy.” Hawkins annotates this as “namely, the epic poets Milton and Spenser.” Oh really? How about Shakespeare, whom Keats addresses directly as “Chief Poet!” in another sonnet. And this is quite apart from sonnets addressed to Byron, Chatterton, Hunt, and Burns. And float with them about the summer waters. Hawkins interprets the “artless daughters” as “Scotland and Wales”. Oh come on! Keats could fall in love at a girl’s glance, at a stranger pulling off a glove. I don’t think he meant Scotland and Wales – he meant girls, classic “English rose” girls, and contrasted them with what he might find in the Mediterranean. Where he went, and died. Few of the sonnets are near as memorable as “On first looking into Chapman’s Homer” or “When I have fears that I may cease to be”, but they are all readable and rereadable, and to have them as this collection is a treat. This entry was posted in poets and tagged Formal poetry, formal verse, Keats, sonnets on 2019-03-26 by Robin Helweg-Larsen.